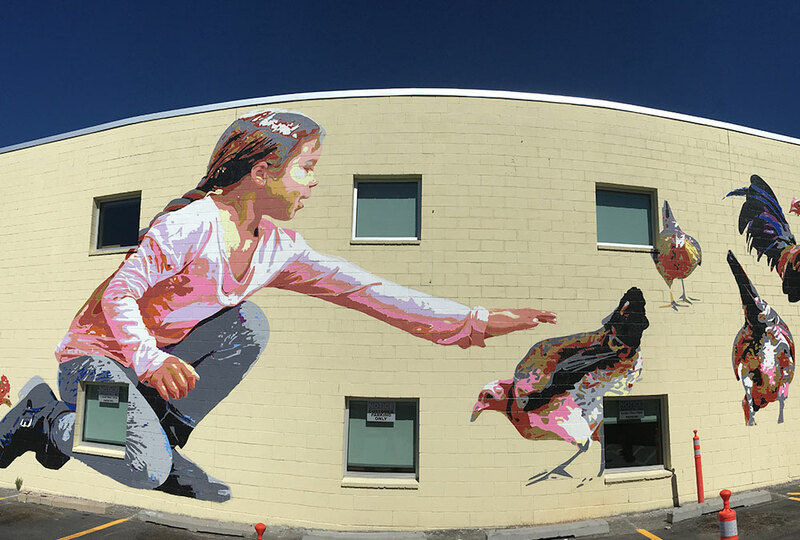 This mural depicts a young girl reaching toward a group of chickens. She might be feeding them or trying to touch them. They are aware of her but, like chickens, are going about their own business. There are two worlds—the human world and the chicken world—and in the mural there is some kind of connection between them. The imagery comes from a photo shoot by Horst in an Albuquerque back yard. One of the beautiful things about Albuquerque is that the natural world is almost always visible in the form of the mountains, the volcanos, the mesa, the Bosque. The presence of farm animals in the city is another way this other world intrudes. Maybe the mural invites some kind of relationship to this natural world, or maybe it just celebrates this beautiful aspect of our city.